The novel Robinson Crusoe tells the story of a young and impulsive Englishman that defies his parents' wishes and takes to the seas seeking adventure. The young Robinson Crusoe is shipwrecked and castaway on a remote tropical island for 28 years. The story may be based on the true-life events of Alexander Selkirk , a Scottish castaway who survived four years on a Pacific island, or Henry Pitman , a political rebel surgeon castaway from a Caribbean penal colony. This classic tale of adventure features cannibals, captives, and mutineers. Some regard it as the very first modern novel written in the English language, launching the publishing industry. 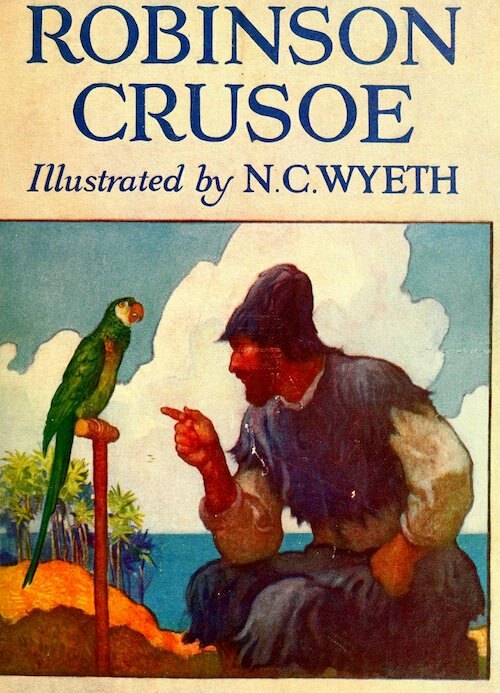 Daniel Defoe published Robinson Crusoe on April 25, 1719. An interesting fact is that the original title was 374 characters long: The Life and Strange Surprizing Adventures of Robinson Crusoe, Of York, Mariner: Who lived Eight and Twenty Years, all alone in an un-inhabited Island on the Coast of America, near the Mouth of the Great River of Oroonoque; Having been cast on Shore by Shipwreck, wherein all the Men perished but himself. With An Account how he was at last as strangely deliver'd by Pyrates . This text features the sublime illustrations of N.C. Wyeth -- works of art to be admired in their own right. Those interested in exploring different theories of Defoe's character inspiration may be interested in Who Is the Real Robinson Crusoe? Featured in our collection of Books for Young Readers. Return to the Daniel Defoe library.